A month ago Bioassociate covered an emerging Pharma market trend: the emergence of a fully outsourced "shell" drug discovery model. Below is a re-run of the article for those who have missed it. Fifty years ago, in-house R&D must have seemed like a great idea. Therapeutic targets flowed like wine, innovation was rife, and internal R&D capability was one of pharma’s sole keys to success. For decades, mammoth pharma conglomerates have prided themselves on being self-sufficient wonder emporiums, opening their doors only to announce the arrival of yet another life-saving formula. Half a century ago, an industry observer could hardly imagine a world where carcasses of groggy, unproductive R&D departments would litter the landscape as a brooding reminder of pharma’s glorious past. The industry situation today is one of decadent demise. Hit hard by the patent cliff, pharma ran dry of capital which could be frivolously thrown at the pipeline in hopes of a miracle. A bitter truth dawned: in-house R&D has become horribly unproductive. Clinical trial costs soared, drug approvals plummeted, and the traditional business model became totally unsustainable (see figure 1). Around 100,000 job cuts later, an overwhelming majority of leading pharma companies can now be seen actively downsizing, if not parting with, their R&D departments. Where did pharma go wrong? In truth, in-house R&D was probably never an optimal model for pharma, but rather a circumstantial tactic which arose from lack of a better alternative. If you get down to the fundamental logic, having your own drug development department in the current economic context makes about as much sense as having your own textile factory if you are a clothes designer. And that is because there are now better, more economical ways of reaching the market without the need to invest in capital-intensive facilities. It seems that Big Pharma may have followed a far too outdated platform, for far too long. Contract research organizations (CROs) begun to spring up roughly a decade ago, at a time when the pharma industry was enjoying immense success. Few would have predicted that this sector would eventually threaten to make the R&D department obsolete. Today, a substantial portion of CROs are ex-R&D departments of failed pipelines, with one crucial twist. Rather than being a means to reaching the market, R&D facilities have become a capital asset throughout the whole development process. Because of this, CRO providers are now able to offer Big Pharma generous savings of 30-40% on overall drug development costs, and many are turning innovators, too. Galapagos NV, for instance, runs a successful hybrid CRO slash innovator business model which works because a significant part of the company’s revenue originates from their very own in-house R&D department. Talk about effective risk hedging. The contract services industry is in full steam ahead: there are contract service providers of just about anything, ranging from R&D to manufacturing, sales and marketing. As per the actual discovery phase, in-house departments have not done that for years, anyway. In-licensing from academia and small biotechs has long become the strategy of choice for market leaders. Lilly and Bristol-Myers-Squibb, for instance, already boast elaborate “lead scouting departments”, whilst 50% of GSK’s pipeline is partnered in one way or another. 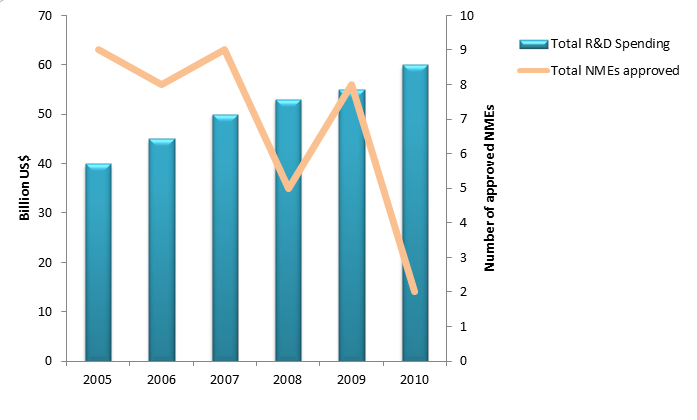 In 2011, licensing agreements were up 14% on 2010 and 178% on 2000. 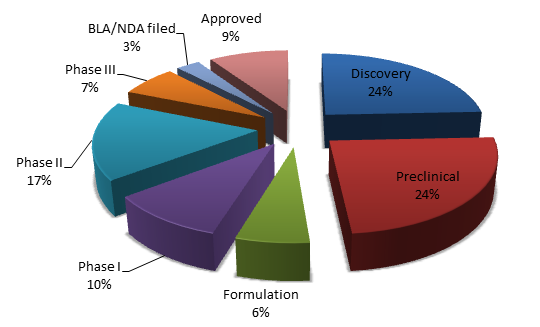 In 2012 the majority of top licensing deals were in pre-clinical stages (figure 2). Where little alternative to “The Big Exit with Big Pharma” existed before, contract sales and marketing organizations now make it theoretically possible for start-ups to reach the market entirely without the help of large co’s. Logically, contract service providers are also realistically able to accommodate an almost entirely “hollow” pharma business model. The fully outsourced business model relies heavily on expertise and effective project management. For Big Pharma, minimizing on bulky facilities means the business model can focus on intellectual capital as the most important asset. For smaller players, where immense capital was previously required to compete with large conglomerates, expertise alone is now sufficient for challenging the leaders. The idea of an “innovation brokerage” is no longer a phantom of past speculation. A number of prototypes of the fully outsourced business model are already in operation, with remarkably promising success. BioLineRx (Nasdaq:BLRX) is a public Israeli drug development company established in 2003. BioLineRx’s business model targets the current trend of late-stage in-licensing by Big Pharma. Outsourcing every step of development, BioLineRx in-licenses promising early-stage compounds, takes them through to late Phase II clinical trials and enters into out-licensing agreements with larger players to complete the process. BioLineRx’s economical and risk-averse strategy has allowed it to initiate 4-6 projects annually, and the company can efficiently advance up to 17 projects at any given time. This stands in stark contrast with one-lead pipeline players whose capital-heavy assets in essence serve to minimize possibilities and maximize risk. To date, BioLineRx has already entered a major partnering agreement and its pipeline consists of 6 clinical and 8 pre-clinical programs targeting schizophrenia, oncology, gastrointestinal and cardiovascular disorders, amongst others. Chorus is an Eli Lilly company created almost entirely around the R&D outsourcing model in 20023. As part of an outsourcing platform, which bears a striking resemblance to that of BioLineRx’s, Chorus aims to in-license early-stage compounds and to advance them through to a clinical proof-of-concept stage. The difference is perhaps that Chorus may have gone a notch further in the notion of outsourcing — the company’s list of Third Party Providers (TPPs) includes a wide array of consultants in addition to their core expertise. To date, Chorus has advanced a dozen of compounds through to Phase IIa trials at a cost of US$ 4.5 million and in an average of just 29 months per project. In comparison, it has been estimated that Phase I trials alone have cost Big Pharma’s in-house R&D departments an average of US$ 32 million1. Will the fully outsourced model stick? A fully outsourced discovery-to-market entity does not, and may never, exist. However, companies such as BioLineRx and Chorus are emerging and growing in momentum and success, bearing bold testimony to the fact that outsourcing doubtlessly delivers immense savings and profoundly minimizes risk. An even more insightful lesson which can be learned from the existing “hollow R&D” players is perhaps the fact that the pharmaceutical industry may finally be transforming from a capital-driven to an expertise-driven market. And perhaps this natural evolution is precisely what is needed to bring waning innovation back on track.